Road Trip Wednesday is a “Blog Carnival,” where YA Highway’s contributors post a weekly writing – or reading-related question and answer it on our own blogs. You can hop from destination to destination and get everybody’s unique take on the topic. Sadly, I think the Hunger Games judges would be sorely disappointed in my general skillz set. I’m certainly not an outdoorsy girl (unless you count reading in the sun, which accounts for my kickass tan), and I’m freakishly lacking in speed, balance, precision and any other remotely athletic ability. I can, however, swim (so I’m like Finnick? Awesome! ), which could probably work to my advantage, depending on the arena. My most useful talent, I think, would involve food preparation. I can whip up a decent dinner when my pantry and refrigerator become sparse, so I could probably do pretty well with the wild meat, nuts, berries and root vegetables that might be available during the Games. Of course, I’d need someone to shoot or snare that meat, and then someone else to gut it and clean it, and then one other person to make a fire, but once I’m prepped, I’d definitely be the food girl. You have me beat on the tanning– I would probably fall victim to fatal sunburn after two days. LOL. I ❤ that this prompt is building alliances. Cooking would definitely be a helpful skill in the arena. Thanks for stopping by, Amanda. 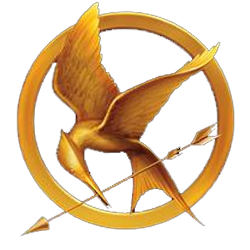 I’m loving the Hunger Games prompt too! Great skill– it comes in handy, if not much in HG world, definitely in this one! Your skill is awesome! I’d need to make a break for that package of Top Ramen.